This new view of spiral galaxy IC 342, also known as Caldwell 5, includes data from NASA's Nuclear Spectroscopic Telescope Array, or NuSTAR. 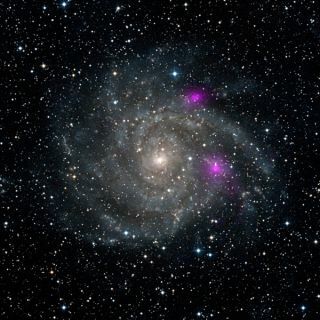 High-energy X-ray data from NuSTAR have been translated to the color magenta, and superimposed on a visible-light view highlighting the galaxy and its star-studded arms. LONG BEACH, CALIF. – A NASA space telescope snapped a new view of two oddball black holes shining ultra-bright in X-ray light in a distant spiral galaxy. NASA’s NuSTAR X-ray observatory spotted the bright black holes while observing the galaxy Caldwell 5, which is located 7 million light-years from Earth in the constellation Camelopardalis (the Giraffe). The black holes, which appear in magenta superimposed on a visible-light view of the galaxy in NuSTAR’s view, present a cosmic mystery: Their X-ray emissions shine as bright as supermassive black holes, yet haven't sunk to the galaxy's core, as such monster black holes usually do. Scientists have dubbed such objects ultra-luminous X-ray sources, or ULXs. The Milky Way galaxy is filled with so-called stellar black holes created by the collapse of individual giant stars, with masses of up to 12 times that of the sun. Yet those black holes don't emit the intense levels energy to form such blazingly bright black holes as those seen by NuSTAR. Supermassive black holes, by comparison, contain millions to billions of times the mass of the sun, usually are found at the center of a galaxy. One possibility is that the black holes seen by NuSTAR are actually of an intermediate size, said NuSTAR principal investigator Fiona Harrison, an astrophysicist at the California Institute of Technology. But intermediate-sized black holes are thought to be much rarer than their bigger and smaller cousins. "High-energy X-rays hold a key to unlocking the mystery surrounding these objects," Harrison said in a statement. "Whether they are massive black holes, or there is new physics in how they feed, the answer is going to be fascinating." NASA’s NuSTAR telescope (the name is short for Nuclear Spectroscopic Telescope Array) launched into space in June 2012. It focuses its observations on high-energy light wavelengths between 6keV and 79 keV in order to take a census of black holes and understand how elements are formed. The two black holes were first spotted by NASA’s Chandra X-ray Observatory, but past images of the objects were blurry. The view from NuSTAR is much more refined, offering a clearer picture of their location in the galaxy, researchers said.